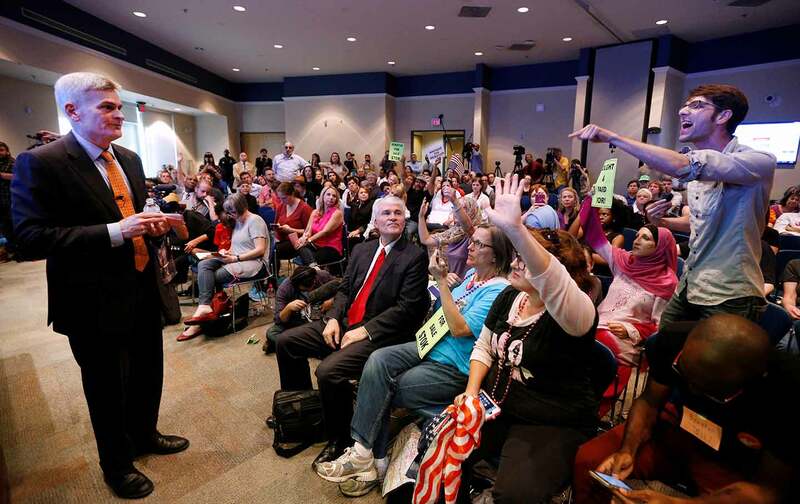 Senator Bill Cassidy endured jeers, boos, and tough questions during town halls in Louisiana this week. The crowd at Louisiana Senator Bill Cassidy’s town-hall meeting, held in a suburb of New Orleans on Wednesday, was is no mood for a lecture. Some people had waited in line for three hours to make sure they got one of the 200-some seats in the library auditorium. By the time Cassidy was due to arrive, the room was packed, with hundreds of others left outside. The mood was tense and angry; the senator was late, and when he finally entered it was to boos, hisses, and chants of “Shame!” He tried to begin with a slideshow laying out the Obamacare replacement legislation he introduced with Maine Senator Susan Collins in January, but he was shouted down. “We can go to your website and read this,” someone shouted. “You’re filibustering!” yelled another. For Cassidy, the meeting only got more difficult. Cassidy was one of several members of Congress to face furious constituents at town halls this week. Senator Tom Cotton in Arkansas, Senator Chuck Grassley in Iowa, and Representative Marsha Blackburn in Tennessee were among those who heard raw, emotional testimony from people worried about losing their health care, among other issues. While Cassidy’s meeting in Metairie on Wednesday was exceptionally raucous, he received tough questions at several other town halls throughout the week, even in more conservative areas. Obamacare, and the GOP’s efforts to repeal it, came up repeatedly—no surprise, as Louisiana is one of 10 states with the largest drops in the number of uninsured residents because of the law. The state only recently accepted federal dollars to expand its Medicaid program, after the election of a Democratic governor. More than 350,000 people signed up in the first six months. Cassidy’s plan for replacing Obamacare is incredibly complex, but in short it punts the decision of whether to keep the law to the states. Local groups inspired by the Indivisible Guide also rallied attendees. Indivisible New Orleans was started shortly after Trump’s inauguration by a single mother of four; she said the group now has about 1,200 members. Lara Crigger, who founded the 300-odd member Metairie Indivisible branch, said previously she’d “never organized anything, not even a bake sale.” Indivisible members were also present at a town hall Cassidy held Tuesday in Livingston Parish, one of the most solidly Republican county equivalents in the country. “They have waked the sleeping giant—middle-aged women,” said Lori Callais, who started her local group after hearing about it on Rachel Maddow’s show. So far she counts 15 to 20 members—that’s a lot, she insisted, in an area where people hesitate to admit they’re Democrats. A number of people came to the town halls with a personal stake in the health-care debate. April and Seth Blackburn of Baton Rouge came to Tuesday’s meeting in Livingston Parish with their 3-year-old daughter, Alaina, who carried a plush pink hedgehog and wore a purple surgical mask. Alaina has leukemia, and the Blackburns wanted to know what will happen to the provision in Obamacare that bans insurers from denying coverage to people with preexisting conditions. April wasn’t satisfied with Cassidy’s answer. “It was a lot of circle speak—‘we’re going to fix it, but we’re not going to tell you how,’” she said after the meeting. If the provision is removed, April worries, her family may have to choose between impossible medical costs, or reducing their income to qualify for Medicaid. Then there was Nancy Holtgreve of New Orleans, who brought her 7-year-old son to the town hall in Metairie. He has mental illness, and their family is covered by Medicaid. “I’m afraid about what’s going to happen to his health care,” Holtgreve said. There were a few people who spoke in favor of repealing Obamacare at Cassidy’s town halls—but then, some seemed concerned that the senator’s replacement plan wasn’t conservative enough. “All this crap about health savings accounts and all that,” said one man at a town hall in Napoleonville, a small town west of New Orleans; he objected to the “red tape” in the senator’s replacement plan. At one point while Cassidy was explaining his replacement blueprint, someone shouted, “You’re describing Obamacare!” There is a live debate about how deeply to gut the health-care law in Congress, too. The gulf between conservative hard-liners and more moderate Republicans like Cassidy is wide enough that repeal legislation in the House is “no longer the slam dunk” that it was previously, The New York Times reported this week. Among the public, the ACA is now more popular than it’s ever been. In Thibodaux, a town that straddles Bayou LaFourche in southern Louisiana, an 82-year-old woman named June Butler asked Cassidy to guarantee that any Republican health-care plan that he votes for will cover everyone who is currently covered under Obamacare. Her grandson, a recent college graduate, has a job that does not provide health insurance; under Obamacare, he’s able to stay on his parents’ plan until he turns 26. Cassidy waffled: “You’re asking me to give an absolute, when I cannot govern what a state does, or an individual,” he said. That was precisely Butler’s point. She reminded Cassidy, a doctor, that he’d sworn an oath—to do no harm.